(Reuters) - Americans who included Mega Million tickets on their holiday shopping lists have a shot at winning more than $300 million in Tuesday's drawing, the largest Christmas Day jackpot in the history of the multi-state lottery. The grand prize has grown to $321 million after a nine-week spell without a winner. Combined with a $294 million Powerball jackpot up for grabs on Wednesday, the holiday week could deliver prizes worth more than $600 million. The televised Mega Millions drawing, only the fifth ever on Christmas Day, is set for 11 p.m. Eastern time (0400 GMT Wednesday), with a machine selecting six numbered balls, including the "Mega ball." There have been no Christmas Day grand prize winners so far, Mega Millions said. The pot, whose value is calculated on the basis of a 29-year payout, is drawn from sales in 44 states, the District of Columbia and the U.S. Virgin Islands. The immediate cash value of the prize, which winners can opt to take, is $193.7 million, Mega Millions said. While the odds of hitting the jackpot are one in 302.6 million, the chances of turning a $2 Mega Millions ticket into a winner of any kind, including a $2 prize simply for matching the "Mega ball," are one in 24. 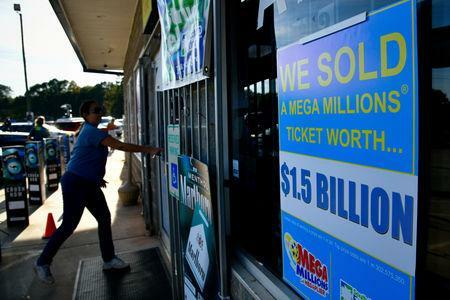 The biggest-ever Mega Millions prize, $1.537 billion, went to the holder of a single ticket in a drawing on Oct. 23. The ticket was sold in South Carolina to someone who has yet come forward, Mega Millions said. That winning ticket fell just short of the U.S. record, a $1.586 billion Powerball grand prize in 2016.